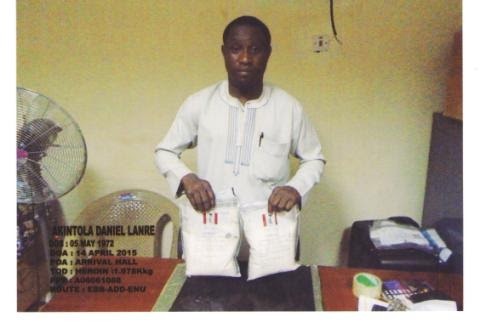 A pastor, Daniel Akintola, has been arrested by the National Drug Law Enforcement Agency with 1.9 kilogrammes of drug substance that tested positive for heroin. It was learnt that the 43-year-old suspect, who pastors a church in Lagos State, was apprehended at the Akanu Ibiam International Airport, Enugu State along with one other suspected drug trafficker, Victor Onwuegbusi, from who 51.5kg of ephedrine was recovered. It was gathered that the pastor had arrived at the airport from Uganda and had tried to abandon the luggage in which he packed the drug when he was arrested. The agency also said the ephedrine was intercepted from Onwuegbusi, a businessman, while he was disembarking from a flight en route from Mozambique. In a statement he made to the investigators, Akintola, who hails from Oyo State, said he went to Uganda for a conference. He admitted that he owned the luggage, but feigned ignorance of the drug. The pastor was said to be unable to provide proof that he actually attended the conference. Onwuegbusi, however, said he was hired to take ephedrine to Maputo, Mozambique for a fee of $2,500, adding that he would have used the proceed to establish a business. The NDLEA commander at the Enugu Airport, Nsikak-Abasi Udoh, said the agency had commenced investigation into the crime. The NDLEA Chairman, Ahmadu Giade, said the agency was fully prepared to unravel every bit of ploy that could be employed by smugglers.